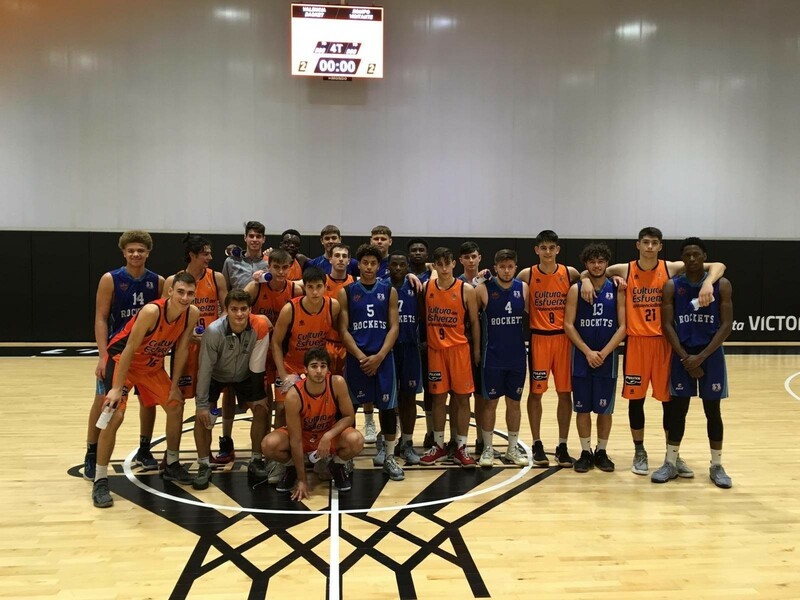 The John Madejski Basketball Academy with Reading Rockets took 22 players to Spain, visiting three of their beautiful cities in Madrid, Valencia, and Barcelona. The group departed from JMA at 2.30am in order to fly from London Luton airport at 6.30am – nice and early, or in most cases no sleep! A relatively smooth flight arrived in Madrid at around 9am local time and the group then started what seemed like an episode of Top Gear in their three 9-seater vehicles driven by Messrs Johnson (Clarkson), Benlloch (Hammond) and Fisher (May). The group was also accompanied by JMA and Rockets Division 1 Men’s Head Coach Alan Keane, as well as JMA’s Rebecca Anderson. First stop for the party of 27 was to their accommodation at Aristos, the home club of former Rockets Coach Raul Lozano, where they would stay for four nights. After a short rest, the team travelled to Fuenlabrada to watch their ACB practice and have a Q&A session with GB Captain Dan Clark and Assistant Coach of Fuenlabrada Anna Montañana who also coached one of the JMA Rockets players Paula Romero Tarrega when she was younger. Tuesday saw the group take a tour of the centre of Madrid with a familiar guide in former JMA Rockets player Iñigo Perez Baena. Later that day both boys and girls teams would play Tres Cantos, the home of both Iñi and Fidel Gomez who also had two years in Reading. Both teams played the club senior teams and were defeated with lots of learning occurring just 48 hours into the trip. Wednesday morning was a time to reflect on the first two days, catch up on some rest, and for the players to meet with their coaches individually to discuss what they would be looking to gain from such an impressive trip. Both girls and boys teams then played Estudiantes that evening with the girls recording their first win coming from behind to take victory whilst the boys fell against a very impressive Under 18 outfit. The following day and it was a trip to the NBA offices in Madrid to meet Alex Sarama. A most interesting presentation from a man that started coaching in Surrey and made the transition all the way to work in the biggest basketball association in the world. Later that day, the group visited the University in Madrid to meet the current GB Women’s Head Coach and Sports Psychology lecturer Chema Buceta. A fascinating insight was given to the players on all things surrounding the mental part of being an elite performer from self-talk, to confidence, to mindset and the like. An action packed day ended with a trip to the Wizink Centre to watch Real Madrid take on Buducnost in the Euroleague with the home team running out convincing winners 89-55. Friday saw the end of the group’s time in Madrid and the three vehicles headed towards Blai Benlloch’s home town of Valencia. 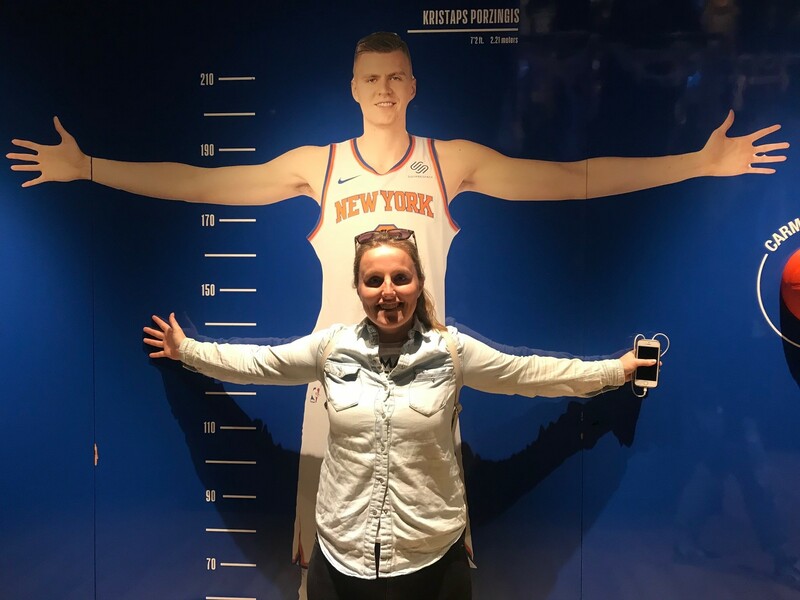 On arrival, the group was privileged to have a discussion with ex-WNBA player and Spanish star Marina Ferragut who is one of the most capped players in Spanish history. The weekend started with a strength and conditioning session for the players followed by a very interactive physio session with Alvaro Gil. The players learnt how to tape themselves and each other in a really beneficial two hours. Later that day it was then time to visit another ex-JMA Rocket in former academy head coach Pedro Garcia Rosado. Now the head coach of women’s division two outfit Picken Claret in Spain, his team secured an 11-point victory. Both teams were back on court practising on Sunday, getting ready for their upcoming games in the second week of the trip before watching Valencia v Fuenlabrada (the team they had previously seen train) in the ACB. Valencia Head Coach Jaume Ponsarnau visited Reading for three months about two years ago and it was his team that secured victory on the day 86-67 in another great spectacle for the tourists. The start of the second week of the trip commenced with another S&C session and practices for both teams before an absolutely wonderful afternoon spent at Blai’s “summer house” where his mum and dad put on the most glorious spread of food including the traditional paella which was magnificent! Some fun then with Blai’s dog, Rudy and Gasol, as well as a trip in the swimming pool for some of our braver students ended what was a much-needed relaxed and fun time together. 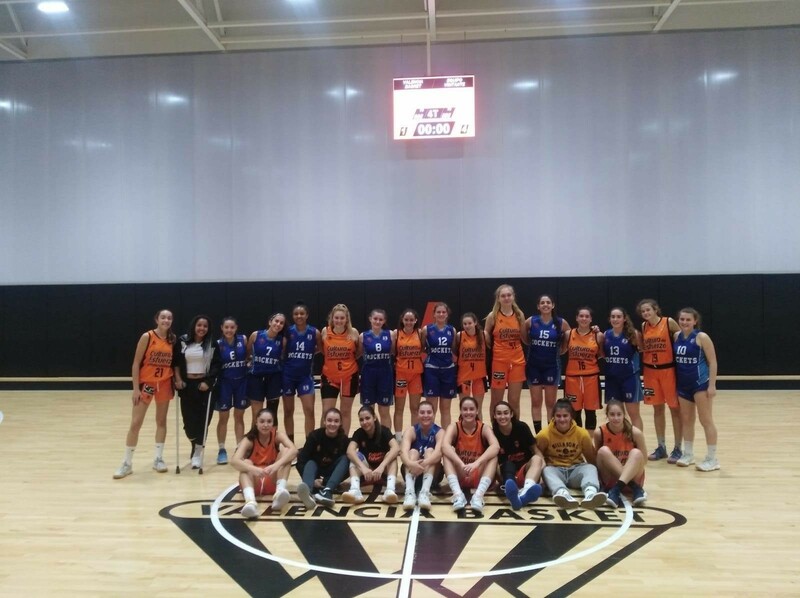 Tuesday saw another action packed day with a trip to Valencia city centre in the morning followed by watching the Valencia Basket Women’s team train at their brand new and incredible training facilities at L’Alqueria del Basket. The girls’ team returned to the venue later in the day to claim a great victory over their Under 18 girls team whilst the boys suffered an agonising two point loss as Ben Fisher took the helm with Alan Keane returning to England on Division One Men’s duty. The next day, the group was back at the Valencia headquarters for a talk with the Valencia Community Manager on all things social media. A very informative talk looked into the detail of Facebook, Twitter, Instagram and how to use all the social media platforms effectively. After some familiar study time for the group it was game time for the boys as they fell to a very impressive Valencia Under 18 team. Thursday came along and after a visit to the Valencia ACB team practice and some memorable time with Jaume, the three vans once again hit the road to Barcelona. A much more peaceful drive ended with a drop off at the hotel before heading to the Camp Nou complex to watch another Euroleague game, Barcelona v Maccabi Tel Aviv where the players and staff would be court-side for pictures with the players before the game. In what was an incredible atmosphere, Barcelona came out convincing winners taking a 74-58 win. Friday, and it was back to Camp Nou for a tour of one of the most impressive football grounds in the world and the museum that accompanies the most impressive of architecture. After a great time there, both teams prepared for their final games against Joventud Badalona. In a shortened game, the girls secured another victory and the boys won their first game of the trip with an impressive 75-70 win on the club’s ACB court. The penultimate day of the tour was a time to really enjoy the city of Barcelona and meet up with one of Rockets’ finest products – Matthew Marsh. 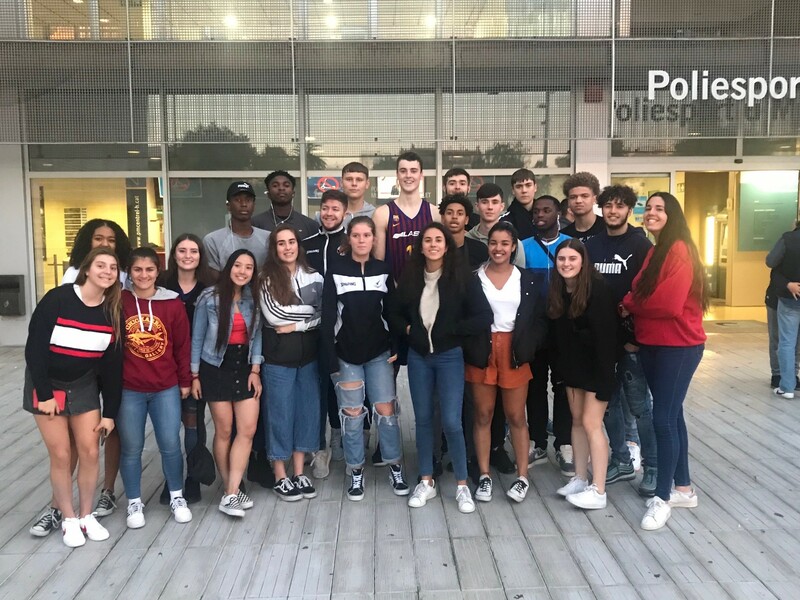 The group travelled to L’Hospitalet to watch Marshy’s Under 18 team record a double digit victory with the 6’11 centre having two big dunks in the game much to the excitement of the supporting boys! Marshy then joined everyone for dinner at Barcelona’s NBA Cafe as the final evening of the trip came to a close. The group returned to England the following morning and arrived back to JMA around 3pm after an incredible two weeks of highs, lows, learning, and enjoyment. Thank you so much to Erasmus, the White Horse Foundation, the John Madejski Academy, and Reading Rockets for making the trip so enjoyable and memorable!